This is a very interesting part of the ancient boundary as it has all the features I enjoy. 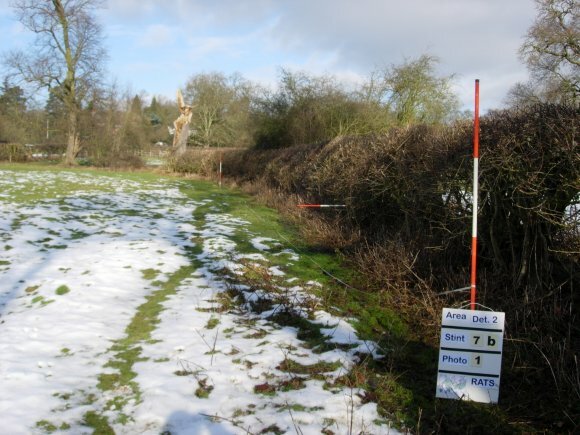 A ditch runs the whole length of this stint and due to the snow melt and rain this was in good use as the outflow from the pond on the boundary in Stint 7b. The field to the right of the hedgerow, part of the Temple area, is higher than the small part of the field outside the Temple area. Trees. The trunks of the hawthorn are ancient, there are signs of layering in the distant past and the elder stumps are very large and twisted. 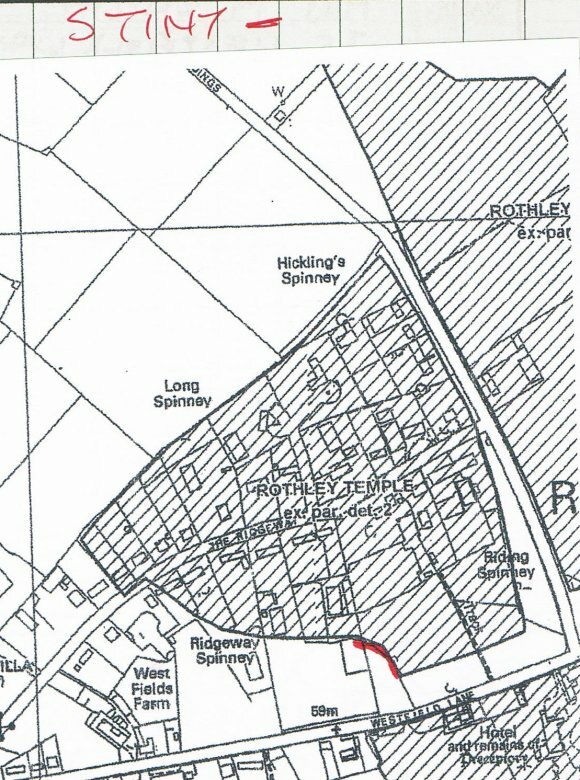 These features indicate an ancient hedgerow. 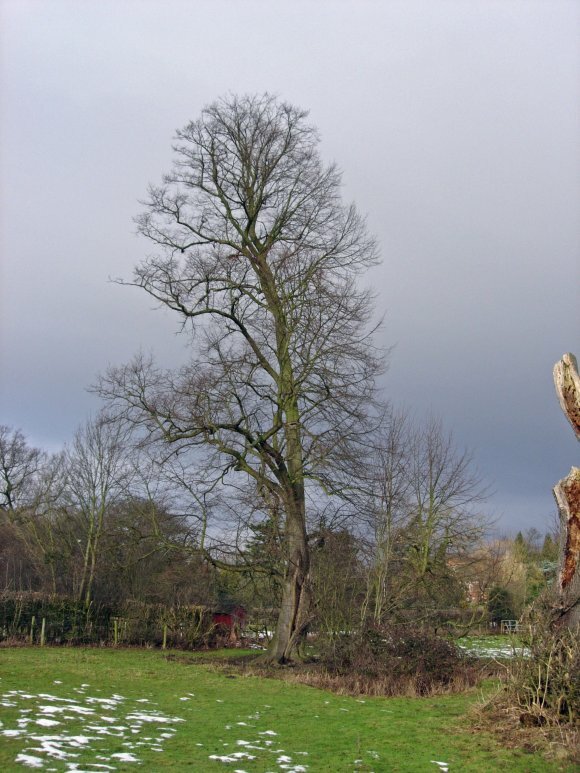 In Stint 7a there is a beautiful, very tall Lime Tree 619 with a girth of 3.3m, an assumed Lime stump Tree 620 in Stint 7 with a girth of 3.4 and Lime Tree 621 with a girth of 3.6m in Stint 7d. Tree 621 has a large split in its trunk, possibly a lightning strike, and this part has fallen to touch the ground and started to grow from new small trunks. Limes can do this and ifleft alone can become a 'Lime Cathedral' i.e. 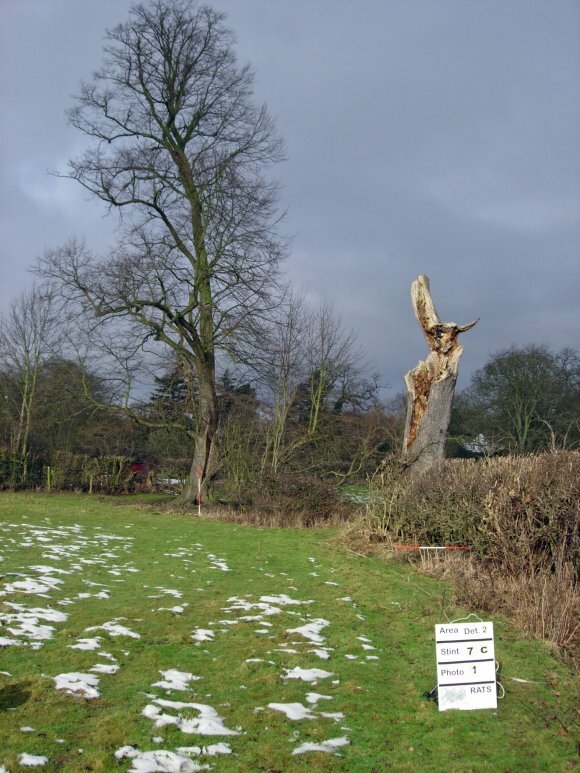 you can stand by the original trunk and be enclosed by arching branches that have re-grown from their bases to form an enclosed space.Tree stump 620 is assumed Lime by its bark, size and other Limes in the same hedgerow. 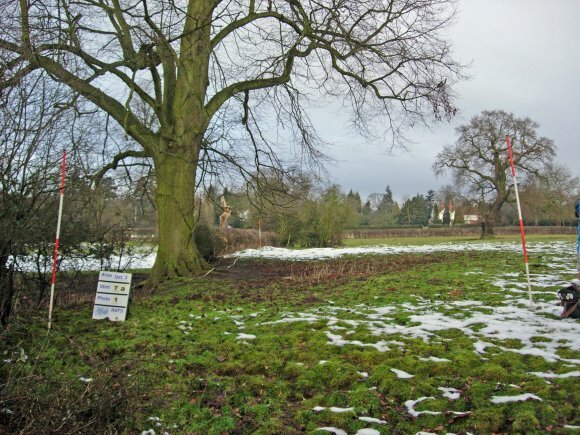 There are other Limes within the old parkland around this area. There are gaps in the hedgerow that appear due to access needs, not because of a poor planting but it is sparse at the end of the stint where it curves round to join the next field. There is a very good pond, Pond 46 Lawn Field Pond, which is bordered on the ancient boundary with Blackthorn. This stint has ancient hawthorn and elder trunks, two mature lime trees and one mature stump, a good ditch running with water, a good field pond and a curving boundary. This is when we completed the last 11 metres of stint 7d in the next field. We first of all spoke with the gardener of the house at 33 The Ridgeway with a boundary to this part of our stint. He had been the gardener for over 30 years so remembered the area well and was able to tell us about the old greenhouse at the back of another house that we found interesting when working in that area. Mr Brian Davenport, the gardener, does have a photo of the old greenhouse and would be willing to supply a copy if we contact him. This final part of the stint shows a change of hedgerow from hawthorn to old individual upright trunks of hawthorn and prunus plus ancient elder trunks. Where we cross the field boundary there is a large decaying tree stump that was said by Mr Davenport to be a Poplar but this does not tie in with any other boundary trees and looks more like ancient Ash. There is still the remnants of a ditch as confirmed by Mr Davenport. There is also a lot of rabbit damage to the lower trunks.